Revere learned the art of silversmithing from his father, a Huguenot refugee who had settled in Boston. Widely praised as a great artisan, Revere prospered—his work is much prized today—but it was for his daring performance as a courier for Boston’s revolutionary Committee of Public Safety that he is even better remembered. On the night of April 18, 1775, he rode through Boston and environs to warn residents that the British, en route to Lexington and Concord, were coming. Thus roused, the Patriot militia was able to offer stiff resistance—and the American Revolution began. 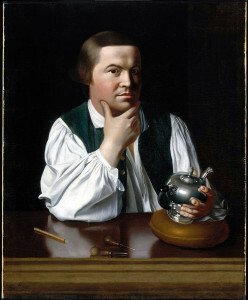 Revere’s deed entered into American historical consciousness largely through the 1863 ballad, “Paul Revere’s Ride,” by Henry Wadsworth Longfellow.